We never know when one will turn up in an estate lot. But if you have or buy a silver dollar that you like, you can have it made into a bracelet for your grandfather. The shop that does our repairs, My Favorite Silversmith, (contact info at the end of this post) can do that for you. Here is an example of a bolo that Henry made for one of his customers. Bell Trading Post was founded in Albuquerque, New Mexico in 1932 by Jack Michelson and his wife Mildred. They sold southwest style jewelry at various tourist locations in the United States. Bell Trading Post got its name from Jack’s wife, whose maiden name was Bell. The types of jewelry sold by Bell Trading Post included sterling silver, nickel silver, gold, and copper. Their main competitor was The Maisel Company until Maisel’s closed in 1968. In 1969, Sunbell Corporation was formed and included these merchandise lines: Bell Jewelry (which now carried the Sunbell hallmark), Gregorian Copper Ware, and Oglala Lakota moccasins from Pine Ridge South Dakota. Sunbell also purchased Maisel’s inventory. Sunbell continued to offer jewelry items, now with the Sunbell hallmark, as well as giftware and moccasins until the late 1980s. 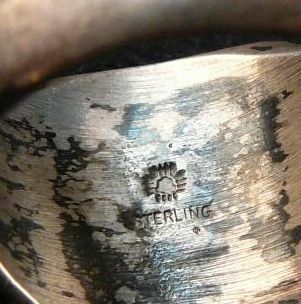 Over the years numerous hallmarks were used on items sold by Bell Trading Post and Sunbell. The hallmarks typically included the image of a bell or that of an arrow sign post with a bell sign hanging from it. Shown here are just a few of Bell Trading Post’s hallmarks. According to a reader who researched the trademark records, the mark “Bell Jewelry” was first used in 1935. The “Arrow post hanging bell sign” was first used in 1961. When the name changed to Sunbell, this is the hallmark often used. I originally wrote this article in 2011 but just updated it after receiving a note from Jacquelyn Michelson: “As the Daughter of Jack and Mildred Michelson you are incorrect in your facts about the Bell Trading Post. It was never called Bell Trading Company and Bell never merged with The Maisel Company in 1935. They remained fierce competitors until the 70’s when Sunbell Corporation bought the Maisel Company. Please correct your facts. Thank you”. So I thanked Jacquelyn for taking the time to write and I have corrected the errors in my article and added more information and photos courtesy of Jacquelyn. I’m so glad she wrote, how else would I have known !! I now want to share with you some references that I had used originally and that I dug out again today as I rewrote this article. I am including them all so you can review the information and draw your own conclusions. As is often the case, things aren’t always black and white. Then in 1957 Jack Michelson passed, leaving the company to his two sons, Jack and Douglas and his daughter Jacquelyn who was a proud and active part of the business. It was Jacquelyn who came up with the name Sunbell and the logo when Sunbell became a corporation. An excellent book Reassessing Hallmarks of Native Southwest Jewelry by Pat and Kim Messier. I’m showing one excerpt here but there are other discussions on this topic and much more ! In the book Fred Harvey Jewelry, there is a timeline that states Maisel’s and Bell merged in 1935 which Jacquelyn Michelson says did not happen. The author of the above book referenced the following book as the source for the merger information. Here is the book cover and the page referenced. Finally, this is another reference with much about Bell Trading Post, Maisel’s and more. Bolo Tie – What is this pendant on a string? I inherited some jewelry and there is a pendant on a leather string. I have no idea what it is and how it is worn. Can you help me so I can know how to describe it to sell on eBay? The photo you sent wasn’t in sharp enough focus for me to post but I was able to see you had a very nice vintage bolo tie. I’ll use one from our pawn shop to illustrate my description. By the way, I encourage you to take the time to take sharp, in-focus photos of your bolo as it is likely to bring a nice price if people can see the details, stones, and workmanship. A bolo tie, also called a “shoestring necklace” or simply a bola, can be thought of as a Western necktie. A bolo tie can range from an inexpensive “string tie” to an elaborate sterling silver and leather affair. Maybe your younger brother had one of those string ties that he wore with his cowboy hat and cap guns ??!! A bolo has three parts. The cord that goes around the neck is called the lariat. It is traditionally braided from leather, and most commonly black leather. The lariat can also be made from woven cord, thus the term “string tie”. And finally we get to the Pièce de résistance which means the focal point, the best part or feature, the artistic creation for which the other portions exist ! The slide. The slide is a decorative feature that, as its name indicates, slides up and down on the lariat. The slide can be worn up at the neck in the same position as a necktie knot (formal) or down lower for a more casual effect. Slides can vary as widely as the artist’s imagination and can utilize many materials. Here are some examples of Native American bolo tie slides. A lovely Navajo bolo slide made from sterling silver, coral and turquoise with leaves, flowers, rope work and other design elements. A unique western spur bolo slide made by Navajo artist TK Emerson from sterling silver and beautiful turquoise stones. A Zuni inlay bolo slide by Simplicio. The horse head is made from mother of pearl and jet. Two turquoise nuggets add a color accent.